I'm pretty geared up for 2019, reading-wise, and I'm hoping that this fire keeps right on burning. Every year I always start off with a bit of a reading slump, a slump that rolls over from the last two months of the previous year. In spite of the fact that I've read 100 books in 2018, it still felt like I was in a massive reading slump for most of the year, especially towards the beginning of the year wherein I my average number of books read per month dropped by half my usual average. In May, even, I only recorded one book read. My best month would have to be October, with a recorded 17 books read, wherein I was on a mission to finish reading all the books I'd picked out for Halloween Bingo! 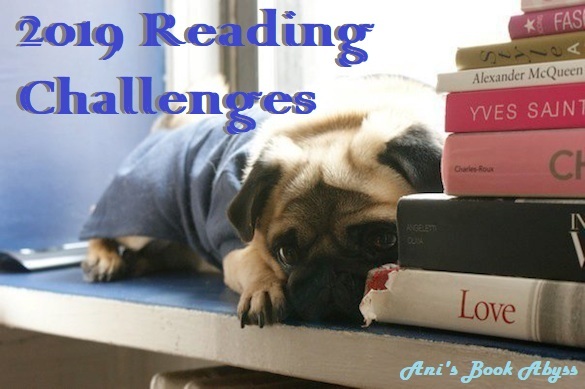 For some more summaries, progress, and updates of 2018's challenges, here is the link to my 2018 Reading Challenges summary page. It's not entirely updated at this moment, and so I will be going back to get it finalized and updated when the end of the year rolls around in a few days. For another look at some of my reflection for 2018's reading year as well as a brief glimpse at my 2019 goals, here's the link to the 24 Festive Tasks: New Year's Eve Tasks Update. As for 2019, I would say that I want to stick with my Laid Back Reading Plans that I'd been trying so hard to manage the past couple years. But being me, I still ended up dropping into a slump and diving gung ho into reading challenges, projects, and readathons. I'm just going to go all out and participate in all the challenges I want and all the projects I plan on creating for myself. I'm going to try not to stress about completing projects, even though I know I probably WILL do as much at some point. But for the most part, after having NOT gotten full marks on some of my reading challenges in 2018, and realizing that it wasn't the end of the world... Well, I'm going to probably just approach my challenges as projects or suggestions--rather than making it my goal to complete my challenges with perfect scores, I'm just going to treat them as "reading suggestions" that give me a direction as to what book I may want to pick up next. If that makes any sense, you know. So, once again, just make the goals. Then see where the year takes me. GR doesn't have its page up yet, so I'll update with a logo and a link later. I have participated in the Reading Assignment Challenge since 2015, starting with the most difficult level for the first two years, but cutting down to easier levels the past two years. But 2019 has a new spin that I really like, so I'm sort of going in with a mediocre/high difficulty level. Links coming soon when I get my summary page and announcement post finalized and published. As per usual, books read must be owned prior to the start of the year. 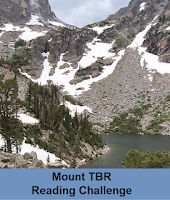 I seem to have the best luck with Mount Vancouver, and since I'm not exactly an ambitious climber, and also because I DO enjoy borrowing books from the library, I'll stick with this goal. Even though the goal If I can claim Mt. Vancouver and advanced toward's Mt. Ararat (48 already owned books), that will be a bonus. 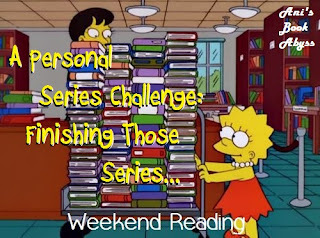 The Personal Series Challenge is more of a project for me than an actual challenge. It's been one of my biggest goals to finish reading series I'd already started... so it doesn't help if my challenge also involves reading new to me series or reading a 1st in a series. So I keep my Goal #1 at 10 books to remind myself to get series completed. I will be updating with links to my summary page and tentative series list announcement soon. In other news, I will also be participating in a lot of as yet announced reading games and challenges, such as Halloween Bingo and the Festive Tasks games if they happen for 2019! Also, Because Reading also hosts a Can You Read a Series in a Month? on a random month each year that I also plan on joining, even though I failed pretty badly this November. Meanwhile, I also plan on participating in the following readathons. Each year I join 24in48 without hesitation, with hopes that I will someday be able to actually reach 24 hours of reading. My highest number of hours spent reading so far was 16.5 hours, and I'm really hoping to surpass that for the next 24in48. The next 24in48 is coming up soon, and I've already signed up! I'll have an announcement post out soon. And lookie there! They even have a brand new logo! 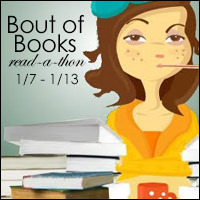 I have not signed up for Bout of Books yet, and I haven't really been participating in all of them. But I'm going to go for it this year, and it looks like the next one starts soon. I'll be working on an announcement and sign up post soon. I may or may not look up some other challenges as a "suggestion" of sorts for what books to read throughout the year. And if I'm feeling up for it, might even sign up to participate officially. But otherwise, this is kind of what I'm looking at for 2019!